I remember my close friend, the trombonist and bandleader Bill Watrous, who died on July 2 and had first joined Local 802 in 1962. We met on a Kai Winding gig, four days in Virginia Beach, Labor Day 1962. One night Kai let me play. In my choruses I played a few high notes. On the break, Bill came to me and said “Nice chorus!” Then he put his finger in my chest and said, “Remember, you play BASS TROMBONE!” That was the beginning of a lifelong friendship. I visited Bill at his 72nd Street apartment where I discovered how he became the great trombonist he was. After greeting me, he played for an hour. Taking a break, we talked, smoked and had a drink. Then he played for another hour. This sequence was repeated all day into the evening. As sad as we are losing Bill, I know he is in heaven, romping with his friends Kai Winding, Danny Stiles, Frank Rosolino, Sonny Russo, Billy Verplank and dozens of others. Rest in peace, Bill. Editor’s note: Mr. Watrous is survived by his wife Maryann, children Jason, Melody and Cheryl, sister Sheila and brother Paul. 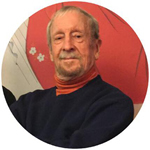 The New York Times honored Mr. Watrous with an obituary on July 11 (see https://nyti.ms/2Larmjp). 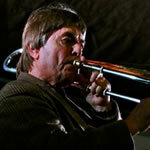 I wanted to let fellow musicians know that trumpeter James (Jimmy) White died on July 10 at the age of 86 following surgeries due to a fall. Jim was born in Stirrat, West Virginia, on Sept. 23, 1931. He was a member of the Stirrat United Methodist Church and graduated from Logan High School, where he was in the marching band. His trumpet playing periodically took him out of high school classes to perform taps at military funerals. His respect taught him perfection. Jim earned his bachelor’s degree in music from Marshall University, where he served as class president. He taught music at public schools in Ohio and Kentucky and wrote music for young marching bands. He played in the Hatfield Big Band before moving to New York and joining high-level groups (including the Dorsey Brothers Orchestra), where he backed up Bob Hope and others. He was featured in Jackie Byard’s band The Apollo Stompers on the albums “Phantasies ” and “Phantasies II.” He eventually managed Emile Charlap’s copy house and contracting agency, where he worked on over 120 film scores and did work for Ennio Morricone and Tan Dun among many others. Although Jim was semi-retired at the end of his life, he never stopped managing scores for Benny Golson. Jim lived happily in New York for many years with his partner, the late Louise Quick. He is survived by his sister Mary Louise White Davis, as well as his nephew, niece and their children. Please join us for a memorial for Jim in September. To RSVP or for more information, contact me at: taonote@optonline.net. The Musicians’ Voice is an open forum for discussion about the state of union affairs. The letters here do not necessarily express the views of Local 802. E-mail letters to Mikael Elsila or write to Allegro, Local 802, 322 West 48th Street, New York, NY 10036. Letters must be no more than 300 words.